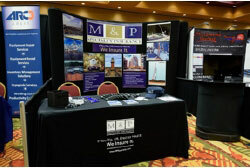 M&P Specialty Insurance exhibited at the 43rd SEAA National Convention & Trade Show held in Charlotte, NC on April 27-29th 2016. With More than 360 steel construction professionals and 50 companies participating, representatives from M&P Specialty Insurance exhibited for the trade show and also participated and sponsored closets to the pin for the Golf Outing. Read more here!